The Hilltop Summer Music Series at the Bookcliffs Arts Center returns in June. The series in on the first and third Thursdays each month through August. Huge transitions at the Bookcliffs Arts Center are under way, with many accomplishments already to show for it. Our community gardens have been bustling with activity, including new mulch and new growth. The renovation of our humanities building is near completion, with the final touches expected to be completed by the end of the month. A huge thank-you to our volunteers for assistance. BAC First Friday art openings continue to be successful, with a special group show coming in June. Finally, our performance arts kick off this week with musical and theatrical happenings. Local improv group the Boomtown Players will host open mic night at 6:30 p.m. Friday at the BAC Stone House, 1100 16th St., for their final run before officially passing the torch to the BAC for future open mic nights, which always draw a wonderful group of regulars and new faces. The bill fills up quickly, so if you have been dancing — literally or figuratively — around the idea of signing up, be sure to get there early and save your spot. This will be the last open mic until September. The Hilltop Summer Music Series returns in June and runs through August. 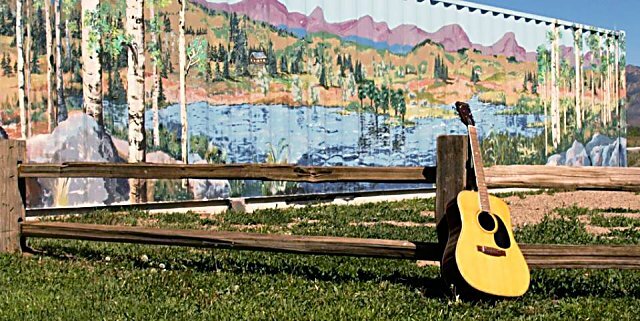 Every first and third Thursdays our outdoor stage will be vibrating with the glorious sounds of both Colorado local musicians, and a few musical guests to be announced. Finally, CMC will host an improv workshop at the BAC Stone House June 12-13. Check out our website at http://www.bookcliffsartscenter.org for more information. There are lots of transitions up here on the hill. We want your input as this movement carries forward. Complete the questionnaire on our Facebook page it and send it back to info@bookcliffsartscenter.org for $5 off your next workshop or BAC event.